My bike functions for work (errands in town, doing trail maintenance on the land), exercise (anytime I'm on it, including planned rides) and play (just enjoying riding on it.) Today was a mix of work (trail maintenance) and fun--as I improved the trail through the dry woods, it made it more fun to ride that trail. 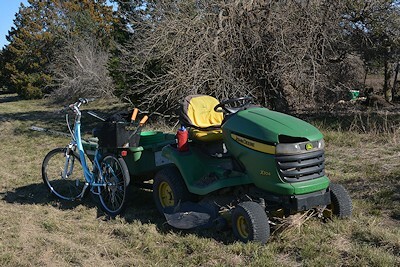 At first, it was "ride a little, stop, cut back elbowbush, cedar elm, cactus, juniper, get the cut stuff off the trail, heaving it (usually) some feet back into the brush...ride a little, stop, cut back elbowbush, cedar elm...etc." But once I'd finished all that, I was able to ride the entire length without brush catching my legs or arms, or limbs smacking me in the face or dragging on my helmet. So I did, nonstop from the south end to the north end, and then back through. 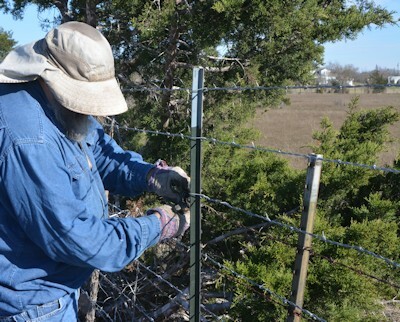 Meanwhile, husband was working on the south fence--doing it by himself, with his health problems, is taking him a long time but he's very determined, and he's got most of it done. (He's also done the west fence. The north fence...is still a problem, and the highway-side fence, that we were going to have done...the contractor said he can't hire the labor now and he's too old to tackle it by himself, so we're considering what to do about that. ) He carries his materials & equipment in the little trailer behind the lawn tractor; I carry mine in the back basket of the bike. Here's a picture of the "work vehicles" partly loaded. 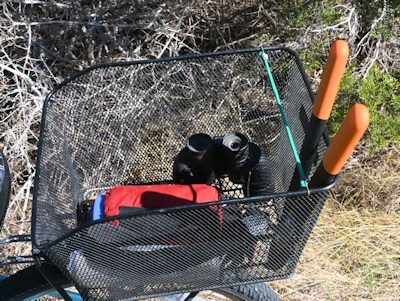 You can see the orange handles of my Christmas-present lopping shears in the bike basket, my water bottle on the fender of the lawn gractor, and some T-posts sticking out the back of the little trailer. Also in my basket was the camera in its carrier, a pair of binoculars, and some crackers. I started working on the dry woods trail, also known as Fox Water or Fox Pavilion trail. It enters the dry woods on the south, and goes up to Fox Pavilion (a rain barn) where the first wildlife waterer was put in, and on up to the north fenceline, then turns west, wiggles south to clear the fencerow growth, and comes out into the west grass at the upper end of the north fence trail. 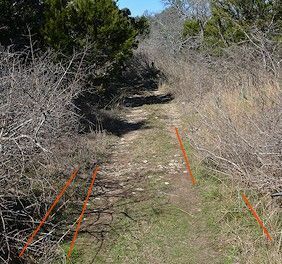 Left: I've just started trimming on the right side of the trail--about 3 feet of trail cut back on right. 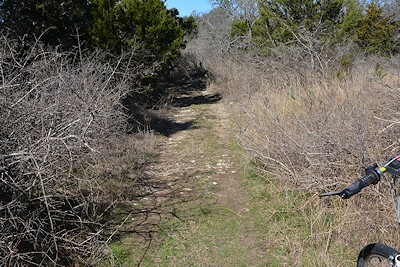 You can see that ahead, the elbow bush is out into the trail. Right: I've added lines to make this clearer. On the left, completely untrimmed, the elbowbush sticks out well into the track, including up high. The leftmost red line shows a minimum distance to cut it back from where it was. Farther ahead, you can see that a branch of juniper sticks out lower, almost across the track. Avoiding it means getting too close to a cactus on the right. So I trimmed that juniper both up higher and also back, giving someone on a bike (or walking) a clearer view of that turn to the right (which is an S curve, actually) and any hazards that might be on it. For some jobs, I might also carry a folding pruning saw. But the new lopping shears handled what I needed to cut today. Or I can carry a sack of bird feed, or even a salt/mineral block, though if I have lot of that to take, I'll grab the little tractor and trailer instead. R- found a desirable native plant seedling earlier in the day, an Agarita (Berberis trifoliata). 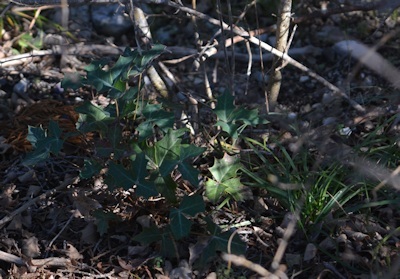 We have tried to reintroduce agarita in the dry woods (an appropriate setting--it likes well-drained rocky soil and is native in this area) but three of four attempts failed in the drought. One survived and is probably the parent supplying the berries from which this seedling came (the seedling is about eight feet from the presumed parent.) Here's a picture of the baby, nestled under a juniper (junipers serve as protection for quite a few things that can stand shade when they're young.) You can just see the holly-shaped leaves. A healthy adult has fragrant yellow flowers and translucent red berries that make good jelly. For the past four years, the lichens on trees and rocks have suffered from the drought, but they're hardy and try to come back with every rain. I saw an exuberant display of them on this trip, as we've had moist weather this fall--some rain, some mist, and less of the harsh drying winds. 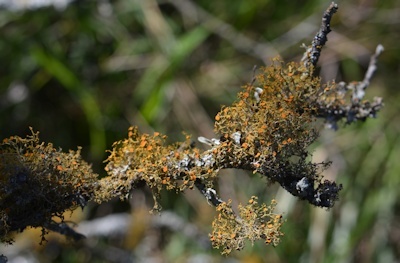 No longer dry, flat dead-gray encrustations on dead twigs and limbs, but the bright orange fruiting bodies and green "stems". After finishing the maintenance work on the Fox Pavilion trail, I rode over to where my husband was putting in T-posts and staves in the south fence. By the time I got there, he had all the T-posts in and was tying the barbed wire to the T-posts, then installing the twisted wire staves. That brown pipe is a device for driving T-posts into the ground by hand. 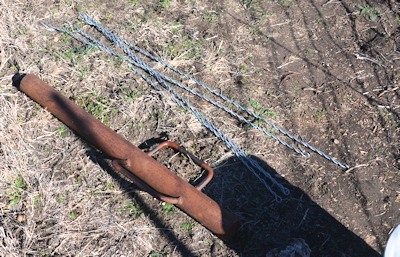 The pipe has a cap welded on one end; you put the open end over the T-post, then lift it with the handles and let it drop on the T-post, keeping it vertical so the T-post stays vertical. It's not an easy job; it's heavy. Beside the T-post driver are some twisted-wire stays. They're twisted onto horizontal strands of fence wire (smooth or barbed) to help keep the strands a constant distance apart. That strengthens the fence and also prevents animals (cows, particularly) from pushing their heads between two wires and heaving them apart so they can crawl through. But this is not a goat fence and will not deter goats. At all. Twisting short length of smooth wire around T-post and barb-wire strand to set distance. You can see the old fence just outside the new one--the leaning, faded T-post and old (thin, rusty) barbed wire. The new fence is nine strands and more than a foot taller than the old one. I'll have to take more pictures of putting the stays in--thought I'd done that today, but apparently I was too busy watching and listening, and not pushing the little button. A good day's work by both of us, but I'm going to be stiff in the morning! Looking out into our damp British garden and there is a Mahonia x media flowering, which must be a cousin to your Agarita. A bit of a different environment! Though we're in the UK's lowest rainfall area - we've had 535mm/21 inches this year (and none forecast for tomorrow) so just above the semi-arid classification - it is still green. That post driver looks like a real shoulder-killer. Mahonia and Berberis are both in the same family; if I understand the most commentary on those genera and the resultant taxonomic moves from one genus to the other, it's now about whether the leaves are compound or not. Agarita does not have compound leaves, so it stays in Berberis. However, Mahonia trifoliata is a synonym (like many in both genera, it's been shoved back and forth a few times as taxonomists have fought over which plant really goes where.) In the mature plant in the sunlight, mature leaves of local plants are gray green with silvery veining; the flowers are scattered along the stems, as are the berries. To get the berries without painful stabs from the thorns, people commonly put a sheet under the bush and then whack the bush with sticks. First, of course, you ensure that there's not a snoozing rattlesnake under the bush--the berries ripen in summer, by which time the snakes often seek shade by day. That's a hazard we don't need to worry about! We only have one venomous snake and the bites aren't very serious for adults, as I discovered by tripping over one when running along a dry woodland path in Sweden. I just needed antihistamines. We certainly know about the thorns, though, as any attempt to weed the bed around the Mahonia is punctuated by yelps. Until today I didn't realise the fruits were edible. I don't know if all Mahonia fruits are edible (though I suspect they are, but variable in flavor.) Agarita berries need a little help to jell well, but even if they stay syrupy, it's great on ice cream or toast or waffles. I think Mahonia berriea are edible, I think they are one of the things Bob Flowerdew will grow and he famously will have nothing in his garden that is inedible. Isn't it's english name Oregon Grape? The regenerative poers of lichen and mosses are amazing, though living in the damp northwest we rarely see them other than thriving. Manchester is know for it's mizzle, not enough downward force to be called drizzle, but enough water in the air to get you thoroughly wet if you walk anywhere. Post rammers certainly give you a work out, I hope you and your husband are not too stiff today. Are those the lightweight, short-handled Fiskars loppers? I discovered those a few years ago, and they're a joy. My helper worker-guys out here even find it feasible, when using the brush mower, to carry them along stuck in their hip pockets! And I have a picture of my nephew cutting greenbrier that shows they are light enough for a five-year-old to use.